A small, brightly colored bird of the far north, the bluethroat (Luscinia svecica) is found in North America only on the tundra of Alaska and the Yukon Territory. It is common across Europe and Asia, however, where it is not restricted to tundra habitat. 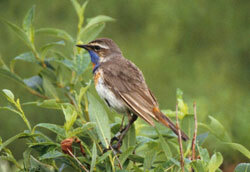 The bluethroat is normally very secretive and hides out in thick vegetation. It is easy to see only while it is singing or performing flight displays. Colville River Delta - can be found in willow brush around Umiat, 90 miles upriver from the coast. Nome - look where water pools in brushy draws along Teller Road and check near the top of the hill before the road descends to Blue Stone Bridge at mile 58. Along Kougarok Road, look among the flat willowy areas around mile 25, between Grand Central Bridge and mile 43, and along the last few miles of the road. Another spot to check is in August around the coastal vegetation and grasses of Safety Sound. Wales – they pass through the village area in early spring. Kotzebue – check the mouth of June Creek and Cemetary Hill in June. Gambell, St Lawrence Island – check the boneyards in late spring.